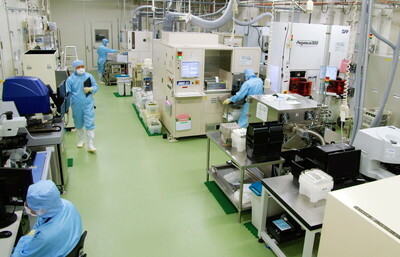 We have established a MEMS (micro-electro-mechanical system) production line that processes 200/300-mm wafers and facilities for integrations and packaging on the premises of AIST Tsukuba East, and are providing a venue to promote open innovation through joint research and/or demonstrative development in collaboration with MEMS researchers from companies and universities. In addition to miniaturization, functionality enhancement, and strengthening industrial competitiveness of advanced MEMS devices, we promote R&D of application-oriented integration and systematization. Through these activities, we aim to develop technologies that will contribute to society in the areas of living environment, infrastructure, and energy saving. Moreover, in these MEMS production facilities, we provide various services of process and analysis for R&D, and foundry services such as prototype device production, to private companies, universities, and academic research institutes. We have established a MEMS foundry (TKB-812) to research and develop advanced integrated-MEMS and fabricate prototype devices using a large-diameter (200/300 mm) wafer process line. We conduct research, evaluation and demonstration of MEMS devices in collaboration with companies and universities. Also, given that the MEMS foundry is an open research facility, we offer various services, such as R&D support, various process and analysis services, and prototyping devices in coordination with MicroNano Open Innovation Center (MNOIC). A gyro sensor using a high-sensitivity pressure sensor that measures inertial force of fluid in a circular channel is robust against noise induced by vibration, etc. 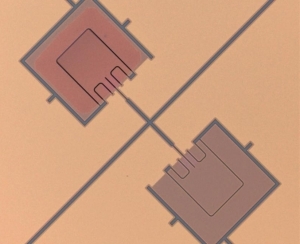 An infrared sensor using nanopillars fabricated by MEMS processing can vary its sensing wavelength over a broad range. Spatial perception technology for robots and autonomous vehicles using these innovative sensors combined with artificial intelligence are now under development. To maintain and manage aging bridges, we are developing a system to monitor cracks and other damages by measuring and analyzing the distribution of strains on the structure of the bridges. The system requires a large number of strain sensors to be distributed on bridges. 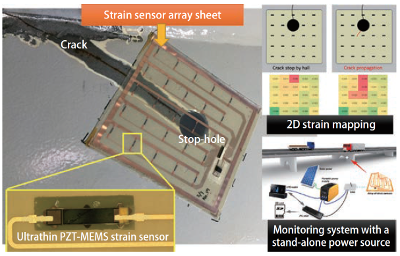 Accordingly, we are developing large-area sensor sheets with ultrathin silicon strain sensors developed using MEMS technology that are arranged in a lattice pattern on flexible circuit substrates. By pasting numerous sensor sheets on bridges and by connecting them to a wireless network, the system is expected to enable continuous monitoring of bridges, and inspection of their conditions at times of disaster. We are developing a wireless vibration sensing system with a self-supporting power supply capable of monitoring the condition of rotating machines, such as pumps, without using power supply wiring or batteries. 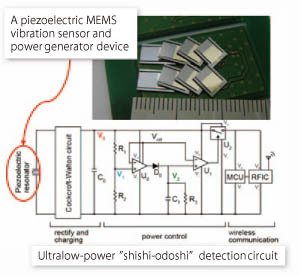 Equipped with a shishi-odoshi(*) sensing circuit, consisting of a piezoelectric MEMS power generator, which harvests vibration energy, a comparator, and a switching circuit, the system is capable of sending data wirelessly using electric power generated only from vibration energy. The system will be useful in continuous monitoring and early detection of malfunction in rotating machines, such as pumps for air conditioners used in lifeline infrastructure in public facilities. * Shishi-odoshi is the Japanese name of a device that uses a small flow of spring water to scare birds away from gardens.